The Roller Derby rules of 1952. They all fit on one page! 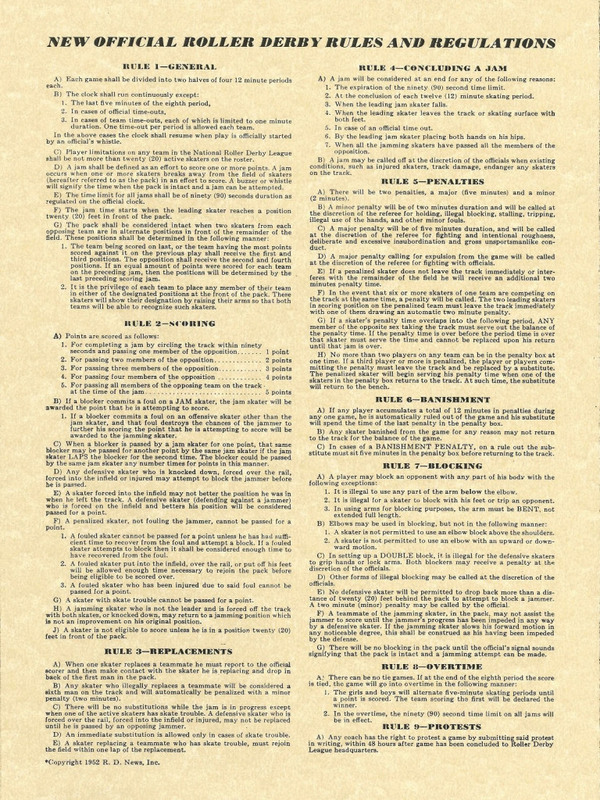 A post on USARS Roller Derby’s Facebook page yesterday showed off a slice of roller derby history, in the form of the “New Official Roller Derby Rules and Regulations” for the 1952 Roller Derby season. It’s a fascinating peek into how derby worked in the black-and-white days. Many aspects of the modern game are present here. Naturally, you still get points for lapping single opponents. There is also the 20 foot engagement zone rule, penalties for illegal multiplayer (“double”) blocks, and placing hands on hips to end the jam, among other similarities. A major difference between then and now isn’t obvious in the rules, however. In the Leo Seltzer “vintage” era of roller derby, one or more players from a team were allowed to skate away from the front of the pack to become a jammer—effectively making all 10 players eligible to score.1 All-jammer gameplay eventually evolved into the pivot game developed by Jerry Seltzer in the 1960s, which eventually turned into the MADE and USARS style of roller derby played in modern times. A teammate of the jamming skater, in the pack, may not assist the jammer to score until the jammer’s progress has been impeded in any way by a defensive skater. This rule appeared to accommodate the defensive players blocking at the rear of the pack, to give them a fair first chance to engage the incoming jammers without having to immediately worry about getting blindsided by a well-timed offensive assist. The old style of roller derby almost always had two, three, or even four jammers attempting to score points on a jam; one would have to wonder if this rule was put in place to give individual defenders some help in fending off multiple offensive threats. Today, such a rule would be nonsense—having restrictions on when a team can play offense would defeat the whole idea of playing offense and defense simultaneously, particularly now that teams will only ever have to defend against a single scoring threat after the initial pass. Still, seeing how the rules were structured back in the old days is a neat way of tracing the history of roller derby and learning about the multitude of ways the game can be played. For an explanation and video on how this worked, see the first 20 minutes of the “Another Derby” Seminar from RollerCon 2013.